this little piggy hides its head. this little piggy won't tread. little piggies get your act together?!" Nothing has driven me more crazy post-stroke than the effect of spasticity on my toes. The tightness through the muscles on the bottom of my foot causes the toes to curl under. Engaging the muscles to walk exacerbates the problem – at its worst causing me to walk on my piggies' knuckles. It hurts. I asked my medical team for help. My ex-physical therapist gave me a blank stare, which made me think I was the only stroke patient who ever had this symptom. My ex-physical medicine doctor referred me to a podiatrist who said she’d cut the tendons under my toes in a few years if they were still troubling me. The FDA has not approved Botox for the treatment of lower limb spasticity, but my new physical medicine doctor has been progressive enough to try it in my foot and to trust my perception that it helps. With time and treatment my muscles continue to relax, allowing my tendons to release with a satisfying "Pop!” I’ve had several popping sensations recently in the arch of my foot. Now my toes want relief. They're greedy that way. Oink. Hope the progress keeps going with them! that's the funniest blog yet! I love it. I'm sorry your toes are not cooperating yet. Hopefully soon. My foot is a mess too...in a different way. I get blisters all over in different places from trying to hold my shoe on. If I could just get over my desire to be fashionable, I would wear tennis shoes and it would be less of a problem. I keep thinking if I keep wearing "cute" shoes eventually they won't fall off. Until then its tennis shoes or blisters. Sigh. Elizabeth, I know what you mean: I'm strictly closed-toes and solid backs or the shoes don't stay on my feet. I don't even do flip-flops out to my hot tub anymore. And no barefoot. Sometimes I walk around the house in my pajamas and tennis shoes! I miss sandals and painted toenails. I'm wearing a bath robe in the morning with orthopedic shoes! Otherwise I really can't walk, my left foot is just too spastic. In the evening I plan the amount I drink carefully, so I don't wake up in the middle of the night, because I have to go to the bathroom. This means waking up my boyfriend, who switches on the light, after that I have to put my socks and shoes on. Everything has become such a hassle these days. My PT knew nothing about what to do, my doctor suggested snipping the tendons(what an idiot). My OT told me I needed an new AFO with a builtin toe crest and metatarsal pad, which is what I did and it helped a lot. My toes still curl under stress and barefoot walking is mostly a no-no. I personally think we just need a researcher to find out how to talk to our spastic muscles so they listen. I'm so glad you went for the toe spacers instead of having your tendons cut. We need our toes to push off with when we take our next step. Thanks for the photo. It really helped. You are so funny! I hope you can get your piggies comfortable soon. I am pretty happy with any shoe that isn't velcro closed now. I learned to hate those running shoes. I love reading about your journey. Your posts are honest and funny, too. It reminds me that there can be a grain of humor even in a painful situation, and sometimes I take myself way too seriously. I think the value of humor is that it can help me with acceptance and perspective. Sometimes my biggest problem of the day is a jam in the copier machine at work that no one can find and we have to call our reproduction department and wait a half hour to use the machine! I love your work - thanks! I have the post-stroke toe curling. I wear velcro-strap sandals in summer and flat mary-janes when it is colder (the elastic across the bridge of the foot holds the shoe on and makes it easier to walk). I have the same problem. The toes of my left foot are also curling. I've had Botox a few times, but my anxiety usually overwrites it. The mind-body connection is very obvious in my case. Before my brain exploded I always wore high heels and now I'm wearing orthopedic shoes. I live in the Netherlands and insurance pays for these shoes and they help a lot to correct my twitching spastic foot. A few weeks ago I have also decided to use a walker to improve my gait. That way I keep on making baby steps in the right direction. Recovery from stroke is possible and I often remind myself that survivors who wrote a book about it, like Valerie Greene, Jill Bolte Taylor and Julia Fox Garisson, also didn't recover within a year. (for me it's 4 years ago now) Recovery is stressful and it's hard to recover when you're stressed out all the time. So I'm trying to find my inner hippie and let her take over. I forgot to write: Keep your piggies at the right length by stretching them. You have to prevent those piggies from shortening. Once a muscle has shortened, it stays that way and can't return to its normal length anymore. A surgeon chooses to operate when the muscles and tendons are shortened and there is no other option anymore. As a last resort. Wow, seems every where a piggy. 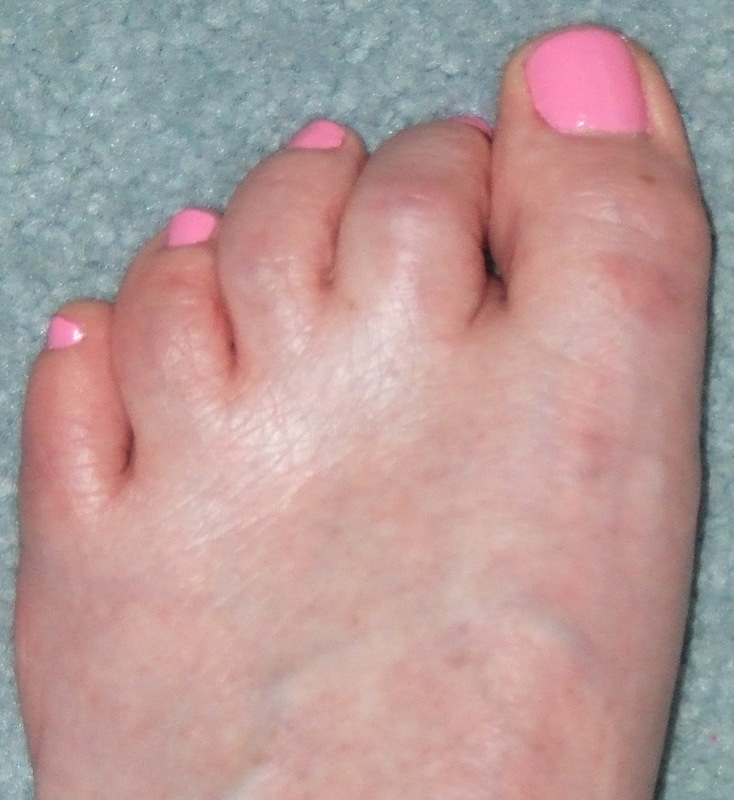 Mine on right foot curl under as well as tighten into spastic drawn irritation of my big toe. My stroke was Christma Eve of 2014. Right side was unuseable. No feeding of bathing etc. Stuborness and good therapist has done me good I guess as I now perform daily rouitine almost normally.Spasticity is my lingering problem. Magnesium Malate during day relaxes my larger muscles. Apple cider vinegar relieves spasms a lot in smaller muscles and I can manage. My arm still bends toward my chest a little but using it constantly seems to improve its nature a bit every day. My foot action is slower and walkin takes thought but now just walk with a limp unless i'm rushed then somtimes i make some unplaned dance steps. I refuse to believe that I can't overcome my stroke and am so stubborn that my muscles better work or else. Somtimes i actually stop and STOMP my right toes with my left foot to draw attention to the toes so they pay attention. Guess what,,, it works. I hope all on here understand that the mind can heal what medicine can't sometime. My son has the same issue. He has a brain injury and left side spasticity. An orthopedic did surgery on his tendons in the toes and on th Achilles. There are two types of surgeries. The surgery my son had only lengthens the tendon. You then where a soft cast and do therapy. It can be repeated when needed but does not permanently cut them. An orthopedic is the way to go. Good luck.. Sorry, I meant wear a cast. Heck since then I've had another stroke that was worse than the first and messed me up good. BUT I'm about back to being able to hide it all because I am so stubborn I won't quit doing ANYTHING. It helps even though it brings tears to my eyes with pain. Hope your son gets better as well. Just don't quit no matter what. I had strokes and not injuries so may not act the same but I've started going to a massage therapist and he almost has my range of motion back to normal and a lot of spasticity in my upper parts subsiding. Next starting next week he is going for my leg to help with my foot etc. I'll post how this works out. I love your writing. It's vibrant and so full of humor. I hope all those toes go "snap, crackle, pop" and start to serve you well again.